RANDALL'S ISLAND — Saying a "new reality" has emerged after the deadly Paris terror attacks, Police Commissioner Bill Bratton and Mayor Bill de Blasio on Monday unveiled a new elite counterterrorism unit. 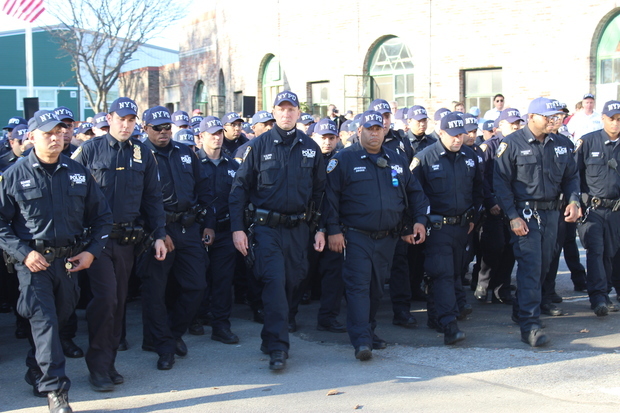 The Critical Response Command team has 500 officers who have received special training in counterterrorism, 100 of which will be on patrol at any time in precincts throughout the city. The unit will be housed in the former headquarters for the Street Crimes Unit on Randall's Island to give them quick access to three of the five boroughs and the city's waterways. "We know our city is the chief terror target in this country," de Blasio said. Bratton said that ISIS, which claimed credit for the attacks in Paris, has surpassed al-Qaida in terms of its ability to hit targets, bomb airplanes and recruit so-called lone wolf attackers, so the NYPD needed to upgrade its counterterrorism efforts. The Paris attacks were especially alarming because of the willingness of the attackers to die while trying to kill as many people as possible, added Bratton. "They came to kill and they came to kill as many people as they can," Bratton said of the Paris attackers. Officials say 129 people were killed in Friday's attack and another 350 were injured. The NYPD is now operating under the assumption that any hostages taken during a terrorist attack are only being used to prolong media attention, said Bratton. All NYPD patrol officers will now get training in how to deal with active shooters, with 3,000 officers already receiving training. Even the Fire Department is being trained in active shooter situations and of fire being used as a weapon, said Fire Commisioner Daniel Nigro. The NYPD and the FBI both have personnel in Paris trying to determine if any of the attack is related to New York City. No connection has been determined so far, said Diego Rodriguez, assistant director in charge of the FBI's New York Field Office. The new officers are part of 1,300 that de Blasio authorized after the City Council and Bratton asked for 1,000 additional officers. De Blasio resisted the call for new officers for months. The mayor said Bratton came to him with the idea to upgrade the city's counterterrorism teams in January after de Blasio returned from visiting Paris following the attacks at satirical magazine Charlie Hebdo and the shooting deaths of four Jewish patrons at the kosher supermarket Hyper Cacher. "No city in America is better prepared to defend against terrorism...than New York City," said de Blasio. City Council Speaker Melissa Mark-Viverito, who took criticism from advocates fighting to improve police and community relations for calling for more police, praised the decision to add more officers. "Today we're seeing the benefits of the City Council's two-year push for an expanded police force," Mark-Viverito said in a statement. "The council believed that by increasing headcount, we would give Commissioner Bratton and the NYPD the tools they need to continue to keep New Yorkers safe."